Despite ongoing reforms, corruption continues to negatively influence Vietnam's society and its business environment. If you own a business here, your company is likely to experience bribery, political interference and facilitation payments. As an individual, your exposure to corruption in Vietnam is still likely, especially when dealing with paperwork and other legal matters. To many foreigners, this can be really annoying and unethical. 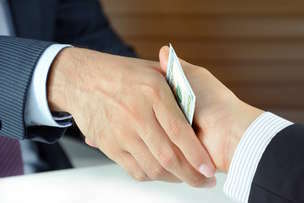 However, some others may see it as an option, the option that they usually don't have in their countries where bribery cannot be used as a "shortcut" for many things. Perhaps the most common form of corruption, the one that you can see on a daily basis in public, is bribery made to the traffic police. When being caught by the police for violating traffic laws, a person has two options: either accepting his license to be confiscated for a month and spending more than half day at the police station to pay the fine or just simply bribing the policeman, with can be only about 50% of the expected fine! If it were you, which option would you choose, putting aside the ethical part? As expected, the majority of Vietnamese, sadly and shamefully, go with the second option. It is much easier and more importantly, is also considered as a norm here. As a foreigner, you will have that option too. Whether to use it or not, it depends purely on your ethics.